There are ultimately two seasons in Lake Tahoe. Summer and Winter. In the winter you are spending time in the mountains overlooking the lake while in the summer you are hanging out on the water looking up at the majestic peaks. Regardless of when you are there, food is an essential part of the experience. For those the south shore, that instantly means the Blue Angel Café. Named after the first ski club at Heavenly, this food joint will blow your mind and electrify your taste buds! 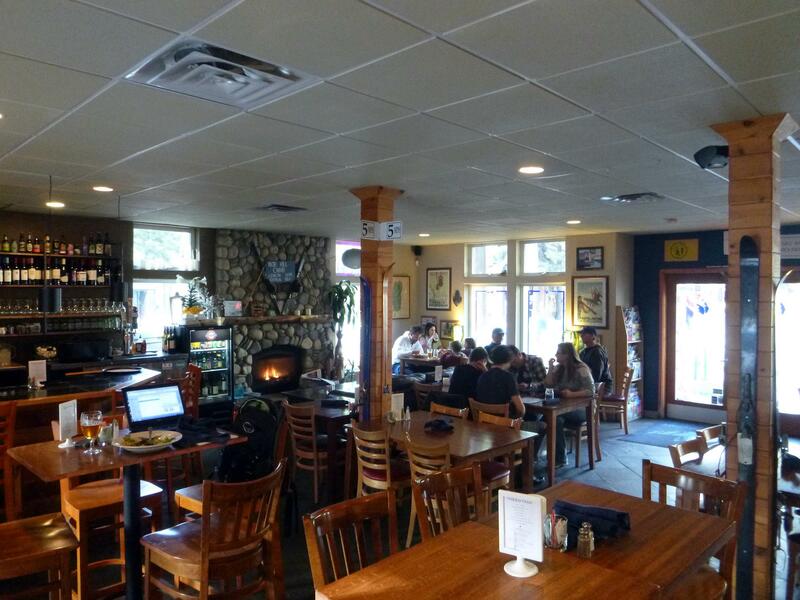 Located off the main drag on Ski Run Boulevard, most skiers whiz by this cozy restaurant everyday when heading up to Heavenly Ski Resort. If they chose not to stop on the way up or down, they are missing out when it comes to a fantastic meal and a great atmosphere. We had a chance to sit down with Belen Urrutia the manager at Blue Angel Café to give us the low down on this essential local spot. To describe her, she is the type of person that makes you feel like you are coming back home. Each visit, she welcomes you with open arms and a smile that will let you feel like you’ve known her your entire life. After a few visits she even remembers your name! Take the opportunity to get to know the people serving you. This bonding experience will leave you feeling like a member of the Blue Angel family. 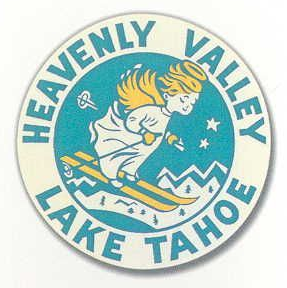 Like all Tahoe locals, the history on how they ended up there is always interesting and entertaining. Rosie, originally from England, spent time in bistros gaining experience. Many years were spent honing her craft in the Austrian Alps. After relocating, she landed in Lake Tahoe. Her husband Jeff, has a resume just as noteworthy. He originally worked in San Francisco as a lead journalist for one of the main newspapers and decided that days filled with more enjoyment and less stress would make for happier living. He quit his job and moved up to Lake Tahoe. Once there he became captain of a boat for Tahoe Sport Fishing. Along with taking charters, he was also hired as the head of public relations for the Tahoe Regional Planning Authority. Jeff was all set, but Rosie was needed an outlet. They found the perfect spot. Together along with Eunie Lylle they obtained the Blue Angel Café. Originally the restaurant was more deli-style focused on fresh pre-made food that you could take with you on your personal adventure for the day. Slowly over the course of a few years the Blue Angel evolved into it’s current state. During the day there’s a loungy vibe, which makes it the perfect place to hang out with your friends après ski or après whatever the consists of. Overtime, Eunie ended up selling her part of the restaurant. This meant both Rosie and Jeff would be much more hands on at the restaurant. They brought on Glen the master chef, originally from New Zealand, and the menu evolved just as much as the atmosphere. For the first time at Blue Angel Café, arrive with an open mind. Try new flavors or risk having something a little bit spicier than you normally would. The menu is filled with items that would fit in Europe just as much as a restaurant in Lake Tahoe. The cuisine won’t disappoint! Here are some items you must try for yourself. This burger is something that seems normal with a clever name. Trust me, it’s anything but…it literally has every animal from the “barnyard” in it. Made with lamb, beef, and pork this burger is a creative adaptation to an old favorite. The meat is cooked to perfection. It takes a little longer than a normal burger to make sure the pork cooks well. There’s a wonderful balance of flavor in each juicy bite. Ketchup and mustard aren’t even necessary! Match this with a side of sweet potato fries and a cold beverage and it’s a excellent take on an American Classic. For a chicken salad to be memorable it needs to be something a little bit different. There has to be something unique to make it stand out. Blue Angel’s Curry Chicken Salad does that. With it’s yellow curry the chicken salad has a bright mustard yellow hue that catches your eye. Once you bite into it the juicy morsels of chicken and taste the slightly sweet and spicy curry sauce, you’ll understand why this has been a staple for over thirteen years. A classic Italian-American dish originating from San Francisco that features mussels, cod, crab & salmon in a tasty herb and tomato broth. This is a real treat for anyone that loves seafood done well. The rich broth, fresh seafood and bread cooked as is should be really exceed expectations. 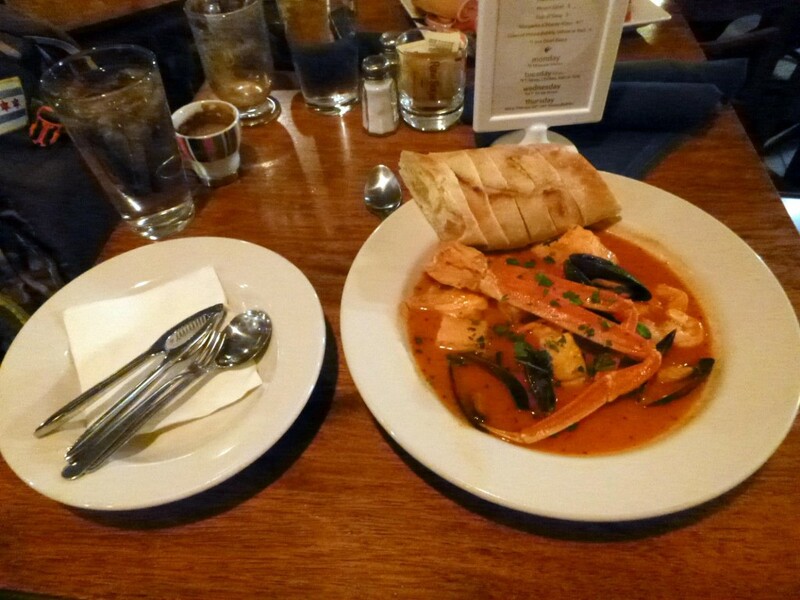 This is one of the best Cioppino’s we’ve tasted. Incredible food also comes a great assortment of wines and beer. 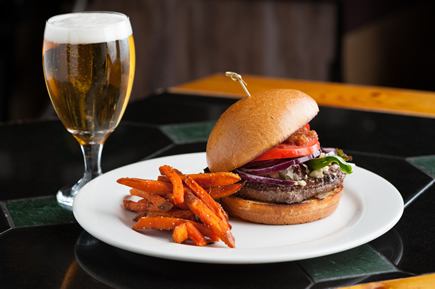 From Deschutes on tap to a very deep selection of wines to choose from, there is something for everyone. They’ve really done their homework to ensure the pairing can please even the most sophisticated palate.The wine list contains local favorites as well as many international choices for those wanting to have something a little bit special with their meal. Like any good eatery, there are staples but the menu is seasonal. During the winter the choices are hearty & warm to feed your soul after a full day of skiing/riding. And in the summer the fare is geared toward being lighter to fit the warmer weather. 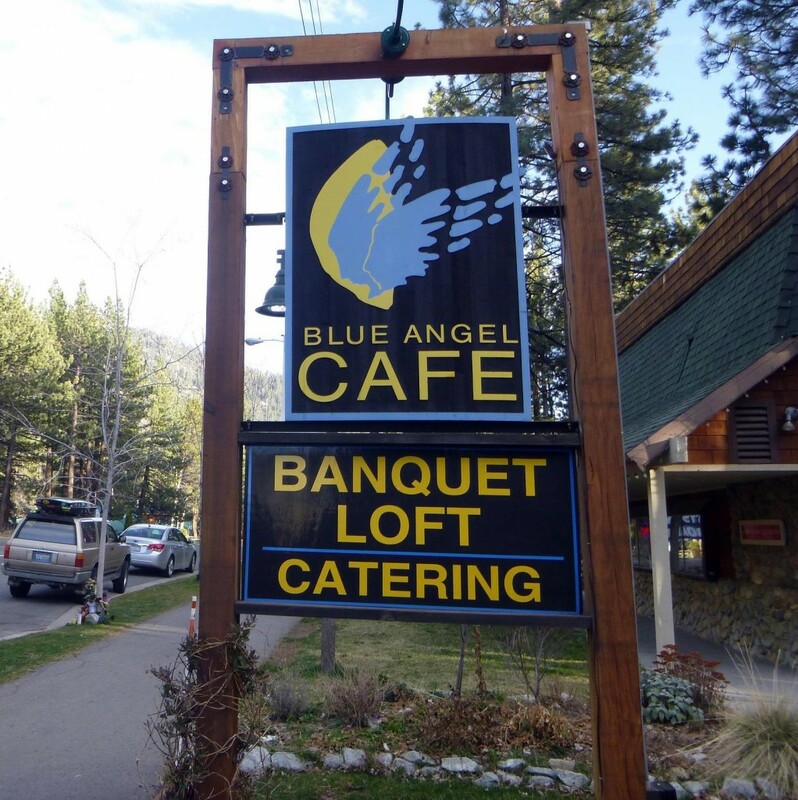 Since it’s mid-May in the next few weeks the Blue Angel Cafe will be transitioning to their summer menu. Check out their new selections and outdoor seating that opens up for the summer months. 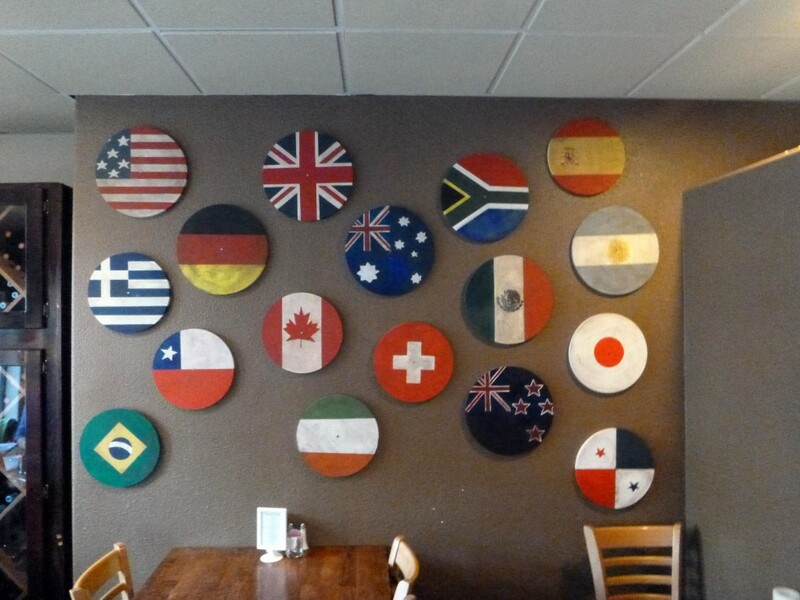 Amazing food, great service, and a deep connection to the community it only makes sense that the restaurant is decorated with items donated by people that live in South Lake Tahoe. A pair of skis that were used by the Blue Angels and a Blue Angel’s patch adorn the walls and really help solidify that this a place for the locals. A constant rotation of people can be seen dropping by just to say hello or get a quick bite to eat. It really shows how tightly rooted this place is in the fabric of the town. You’ll see everyone from Heavenly instructors (that have been teaching skiing for 30 years) to Olympic Gold Medalist, Jamie Anderson hanging out at this place. Most importantly… relax it’s Lake Tahoe!